KraftingK: Seasonal Catalogue Stamp n Hop blog-hop. Seasonal Catalogue Stamp n Hop blog-hop. This is my first time joining the Stamp n Hop so I hope my projects are up to the mark. A few weeks ago I was fortunate to win a prize draw within a group I belong to. I received the Spirited Snowmen stamp set in the post. I was excited as it wasn't a set I had set my heart on, but I love a challenge. Today I have three cards for you. One very simple, one with a bit of a twist and one that my regular skilled monthly crafters would love. The first card is mostly just stamping, with only 2 colours of ink. The die cut circles use the stitched framelits which are always out on my big shot and the dancing snowman is coloured with the marker pens. All finished off with the lovely spotty ribbon. The second card uses the ice skating snowmen. I have reversed the image which gives a demonstrating point when done in class. I have used a few of the Blend pens to colour this , good for the background colour as it dries so smooth. Finally a card for the skilled crafter. Lots of daubing, my favourite technique. I have water coloured the snowmen with an aqua-painter then fussy cut. 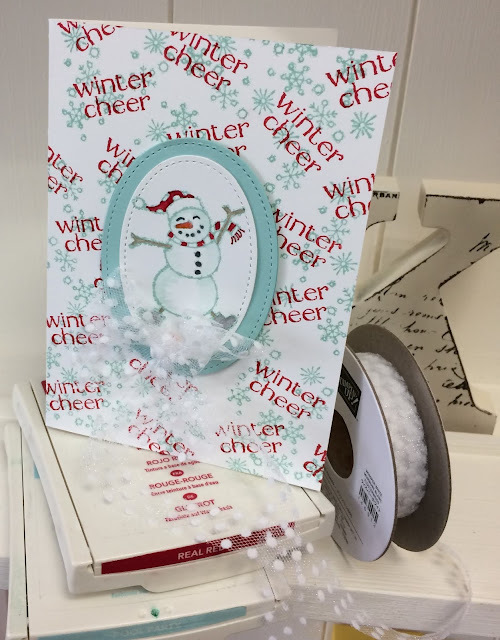 The white is heat embossed and finished with a die cut in the glimmer paper snowflake. With my wedding anniversary in 10 days - 36 yrs the sentiment is appropriate. Ahhhhh. Now time to hop on, next you will find some fabulous makes by Kaylee van Es or if you are going backwards or anti clockwise check out Vicky Wright in Australia. Isn't it wonderful that we can hop around the world. Cute, my favourite is Mr & Mrs Snowman ! lovely cards. Your anniversary one is my favourite. Too cute.